SpeedTest is a small Windows-based utility which measures the speed between to computers connected on a local network. The measurement is completed by using a client-server setup where one computer acts as the client and the other as a server. The client can measures the speed from the server-machine. 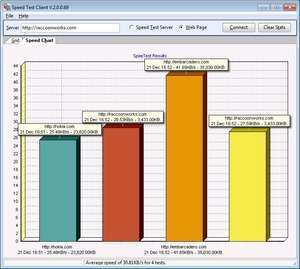 SpeedTest may also be used to complete online Internet connection tests. For security reasons, you should also check out the SpeedTest download at LO4D.com which includes virus and malware tests. Additional screenshots of this application download may be available, too. 2.15 out of 5 based on 9 ratings.